I think following on from last weeks Sunday Edit, my payday wishlist posts are really starting to dwindle with less and less items. Purely because I'm starting to get "THE GUILT" (yes I needed capitals) about what I spend my money on. Take last week I went shopping with Michelle and I needed tights and some jeans - what did I leave the Metro Centre with? NEITHER. Feeling guilty over a £3.50 pack of tights from Primark, howay Raymondo give your bloody head a shake. Anyway I've decided that just because I've got a house I'm not going to stop buying the occasional item (or two) of clothing once I've moved in. 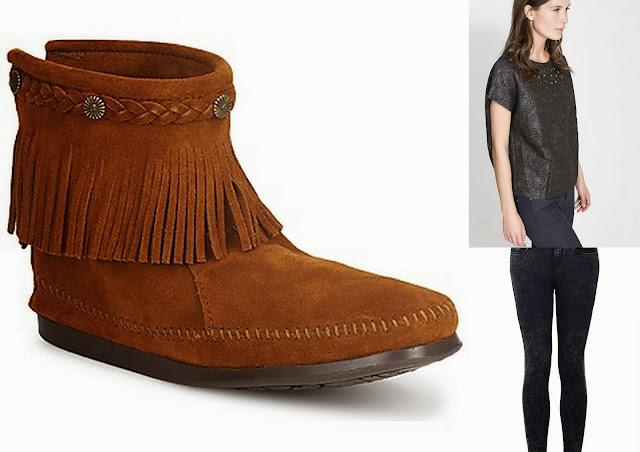 First up as its starting to become freezing I need to invest in some new ankle boots and these Minnetonka moccasin boots will do before the wet weather comes. I don't know if its just me, but I love the contrast between denim and suede - maybe I was half cowboy, half indian in another life? Talking of jeans I will finally get around to purchasing a pair of Topshop Leigh Jeans, although I've heard a lot about these stretching and going out of shape straight away? Is this the case? If they do I think I'll spend the £38 for these elsewhere. Finally an embellished top from Zara, even though I don't think their A/W collection is up there with previous ones, I am loving their offerings. I've seen this top in store with the matching skirt, and I think this would look ideal with jeans or leather trousers (I'll never fit in leather trousers, but the thought is there). However it does look quite short, therefore this will no doubt be veering on crop top level with me.